Search again Found 39 results for your search. Showing page 1 of 2. The Tasmanian Museum and Art Gallery, Hobart, Tasmania becomes the first museum in Australia to repatriate Aboriginal remains, with the return of the remains of Truganini to the Tasmanian Aboriginal community . The Royal Society of Tasmania had exhumed her body 2 years after her death in 1876 and put her skeleton on public display for 40 years. Tasmanian Museum and Art Gallery, Hobart, Tasmania returns the Tasmanian Aboriginal human remains commonly known as the Crowther Collection (33 skulls and three skeletons) for cremation at Oyster Cove. The "largest gathering of Tasmanian Aboriginal people in a decade" attends the cremation . Royal College of Surgeons, Dublin, Ireland gives back the head of the great-great grandfather of Tasmanian lawyer Michael Mansell after he went to Dublin petitioning for the return of Aboriginal remains including the one of his family . The Royal College of Surgeons of Edinburgh, UK returns 500 remains. The Edinburgh Museum, Scotland returns remains that were dug up from burial grounds in South Australia. Royal College of Surgeons, Dublin hands over 60 Aboriginal human remains to Aboriginal representatives, who had travelled to Ireland to collect the remains and return them to Australia . The Museum Victoria returns the remains of an Aboriginal baby girl nicknamed 'Jaara Baby' to her modern-day relatives, the Dja Dja Wurrung people of north-west Victoria, 99 years to the day after they were found in a tree trunk by a woodcutter. Skull of an indigenous person (Andaman Islands). Many Indigenous remains like these are still held in museums all over the world. Lack of cultural sensitivity or museum personnel impede their examination and return. Museum of Ethnography, Stockholm, Sweden sends back 20 Aboriginal skeletons it had collected in 1910-11 from the Kimberley, Western Australia , the first voluntary repatriation undertaken by a major European museum [15182a]. Natural History Museum, Britain agrees to return the remains of 18 Tasmanian Aboriginal people, but only after it conducted scientific tests on them . Glasgow Museum, Scotland. Return of skulls of Torres Strait Islanders to their ancestors on Mer Island. Museum of Ethnography, Stockholm, Sweden returns 10 Aboriginal remains which were taken from graves in the Kimberley region of Western Australia by a Swedish archaeological expedition in 1910 and 1911 . Lund University, Sweden. Return of the remains of two Aboriginal people that had been in the museum's possession since the end of the 19th century. This return brings the Swedish remains returned to Australia to 32 . National Museums Scotland. Return of six Aboriginal skulls. Edinburgh University, Scotland. Return of the last remains in its collection to members of the Ngarrindjeri people (SA). Charite Medical History Museum, Berlin, Germany. The museum's director announces his intent to return the skulls of 18 Aboriginal Australians taken to Germany more than 100 years ago. The Charite would be the first scientific institution in Germany to return remains. University of Oxford, Britain agrees to hand over the remains of three Aboriginal people. The three human skulls and lower jaws - acquired in the 1860s and held in its museum of natural history - belong to the Ngarrindjeri people from Goolwa (Port Elliot) in South Australia . Italy and Australia sign a repatriation agreement. Booth Museum of Natural History, Brighton, Britain promises to repatriate two skulls and two thigh bones, donated almost 100 years ago . The museum also holds a Ngarrindjeri skull which has been turned into a water carrier and is considered 'extremely rare' . 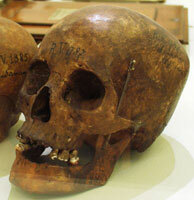 The skull is with the museum since 1925 when it was donated by a local collector. 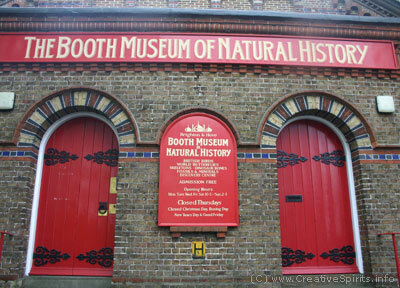 Booth Museum of Natural History, Brighton. Even small museums hold Aboriginal remains which were often donated by private collectors.